Yamaha is recalling each and every YZF-R1 and YZF-R1M, their new flagship superbike, all over the world. Because it could light you on fire. Or seize up and make you crash. 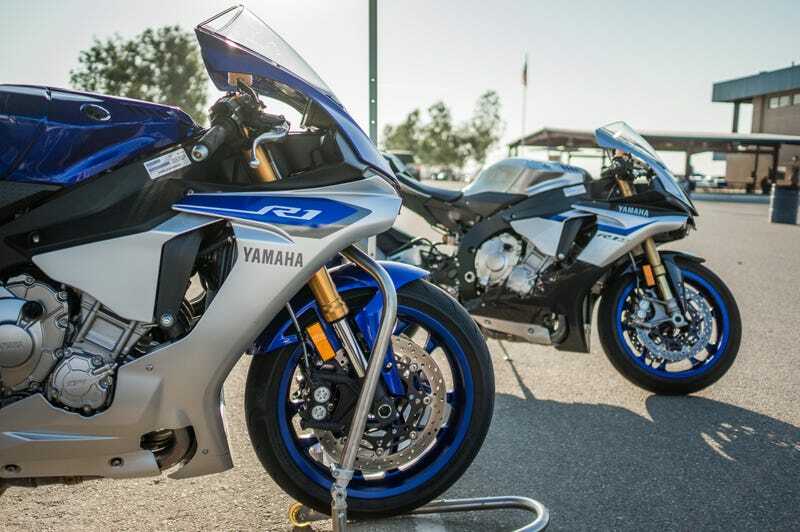 The 2015 Yamaha R1 and R1M literally blew our minds when we test rode them earlier this year. We called it “Superhero power made easy,” and we meant it, because it puts incredible power in a package that even normal guys can make go fast. There’s only one problem, and that’s that it also might kill you. You owners should have gotten a letter but, to remedy this, Yamaha is recalling all of the bikes to replace the entire transmission assembly, which they say will take roughly 16 hours to complete. This notice is sent to you in accordance with the requirements of the National Traffic and Motor Vehicle Safety Act. Yamaha Motor Corporation, U.S.A. has decided that a defect which relates to motor vehicle safety exists in all 2015 YZF‐R1 motorcycles. Our records indicate that you own the affected motorcycle shown above. In affected motorcycles, both second gear wheel and pinion gears in the transmission may break as a result of extremely high stress and/or improper shifting. This is due to inadequate component strength and stress concentration at the gear teeth bottom land. In addition, the third and fourth wheel gears may be deformed or break as a result of excessive stress caused by hard usage. This is due to inadequate component strength. If gears fail, the transmission could lock up, causing loss of control that could result in a crash with injury or death. To correct this defect, your authorized Yamaha dealer will replace the transmission assembly with one that includes gears of a different design. The procedure takes almost 16 hours to do but be aware that your Yamaha dealer may need to keep your motorcycle longer depending upon their current service schedule.There will be no charge to you for this procedure. Please call your Yamaha dealer to make a service appointment to have this procedure performed. At that same time, you can find out how long they expect to keep your motorcycle for this service. Remember to take this letter with you when you take in your motorcycle. You should not ride your affected motorcycle shown above until this modification is performed. If you are unable to return to the Yamaha dealer who sold you the motorcycle, this service will be performed by any authorized Yamaha motorcycle dealer. For the name of a dealer near you, call 1‐800‐88‐YAMAHA or visit the Yamaha web site at www.yamaha‐motor.com. If you have had this repair performed before you received this letter, you may be entitled to receive reimbursement for the cost of obtaining a pre‐notification remedy of the problem associated with this repair. For more information, contact Yamaha Customer Relations at 1‐800‐962‐7926. Federal regulations require that any vehicle lessor receiving this recall notice must forward a copy of this notice to the lessee within 10 days. If, after contacting Yamaha Customer Relations, you are still not satisfied that we have done our best to remedy the situation without charge and within a reasonable time, you may submit a written complaint to the Administrator, National Highway Traffic Safety Administration, 1200 New Jersey Avenue, SE., Washington, DC 20590; or call the Auto Safety Hotline at 1‐888‐327‐4236 (TTY: 1‐800‐424‐9153); or go to http://www.safercar.gov. Refer to campaign 15V802. If you have sold your motorcycle to another party, please call us toll‐free at 1‐800‐962‐7926 with the name and address of the new owner, along with the serial number shown to the right of your name on the address label above. We’re sorry to cause you any inconvenience, but we are sincerely concerned about your safety and continued satisfaction with our products. Thank you for giving your attention to this important matter.